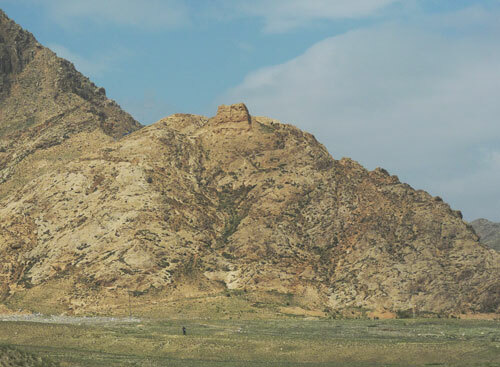 Our driver has agreed to take us all the way to Bayan Khot via Guangzong Si (once one of the most important monasteries in Mongolia) for 300 Yuan; or at least that’s what we think … We have managed to get up reasonably early and are making good progress. 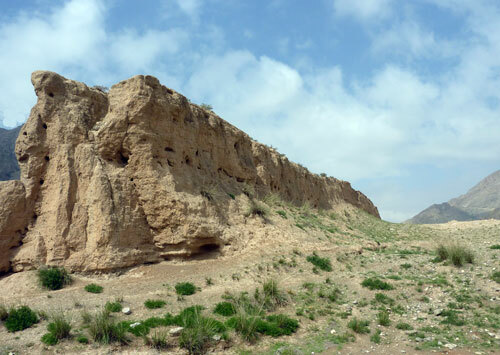 The first highlight of the day is when we suddenly catch sight of the ruins of the Great Wall! This is the real thing: unrestored, without tickets, souvenir stalls, or people. It is just standing there, defiant, majestic, having weathered so many centuries. Of course, there’s not much left of it, it’s been reduced to a crumbling pinkish pile of earth, riddled with holes. But we don’t mind, we’re just thrilled to be there. On the one side of the Wall there is an ugly factory and a brand-new motorway in the making, but the other side is all rolling meadows and hills. 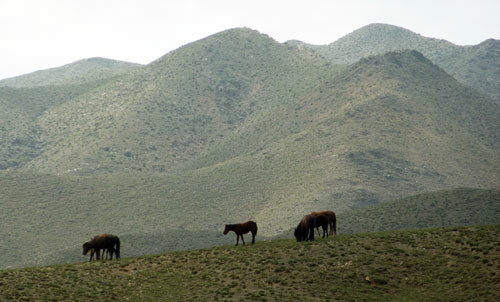 There are some horses grazing in the distance, and the remains of a watch tower form a small hump on a hilltop. Back on the road, the green-yellow box-shape of our taxi looks curiously out of place. We get back in and continue our journey. At the next tollgate of the ‘old road’ we are told that the new motorway is actually open, only, there are no tollgates yet… We’ll just have to use it for free then. So there we are, speeding along an impressive stretch of motorway, completely devoid of traffic. It’s yet another of the many signs of development we are seeing in both Ningxia and Inner-Mongolia, supposedly some of China’s poorest provinces. Obviously, there must be many deprived places and poor people, but we haven’t seen them yet. 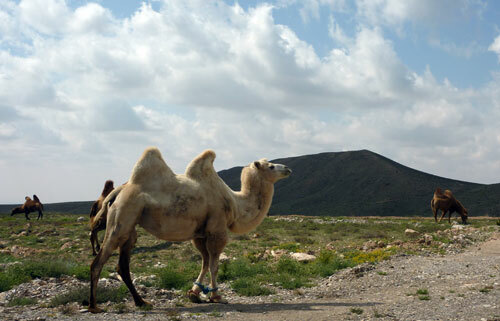 The second highlight comes just after the turn-off to the monastery when we spot a herd of camels by the side of the road! 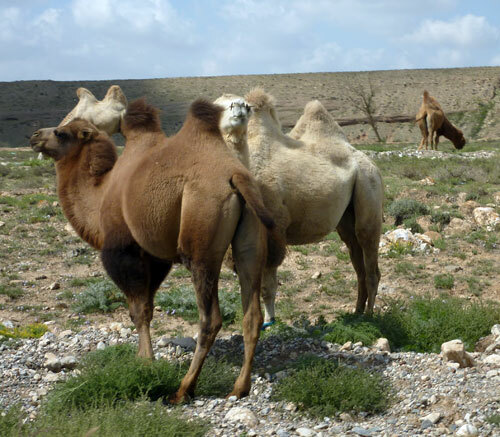 Silly Western tourists that we are, we get all excited seeing these real ‘working’ camels, as opposed to those done-up ones, posing for tourist photos, which are a common sight near Chinese tourist attractions. A proud, handsome white male seems to be in charge of the herd and he gives us a haughty, disdainful look as we pile out of the taxi and start snapping away. 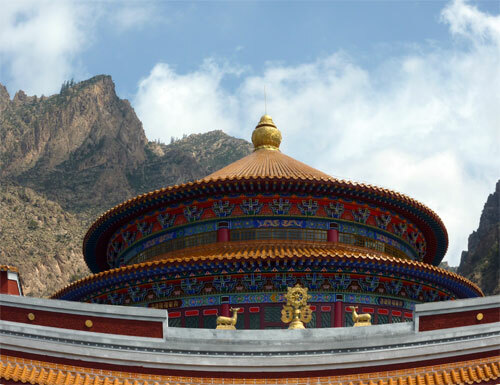 On arrival at Guangzong Si 广宗寺, or Nansi 南寺, we are in for two further surprises. 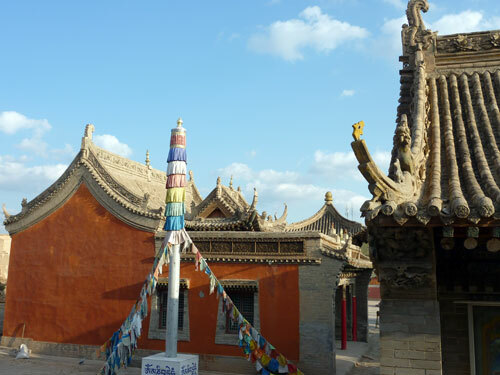 The first is that the temple complex is extremely developed: we enter through a big gate, complete with ticket office and piped Buddhist music coming out of some loudspeaker system. The second is a bit more worrying: as we are parking, our driver suddenly asks us where we are going to spend the night and how we are going to get to Bayan Khot tomorrow… He seems to have misunderstood us (again) and thinks he’s going to drop us here! Once he realizes what our intentions are, he starts grumbling about the distance and the time. We suspect that he wants to get home early, as it’s the Moon Festival tonight. Anyway, we manage to calm him down by promising more money and assuring him we won’t be long. 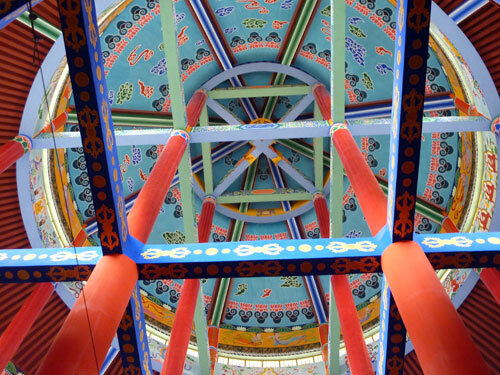 As the monastery was destroyed during the Cultural Revolution, the temples are all brand-new and made of concrete, though beautifully and colourfully painted. We meet a monk inside one of the halls and he confirms that it’s only three years old. He also tells us he’s from Ulaan Baatar and asks what the city is like these days. When we describe how developed and prosperous it has become (in a way), he seems content. 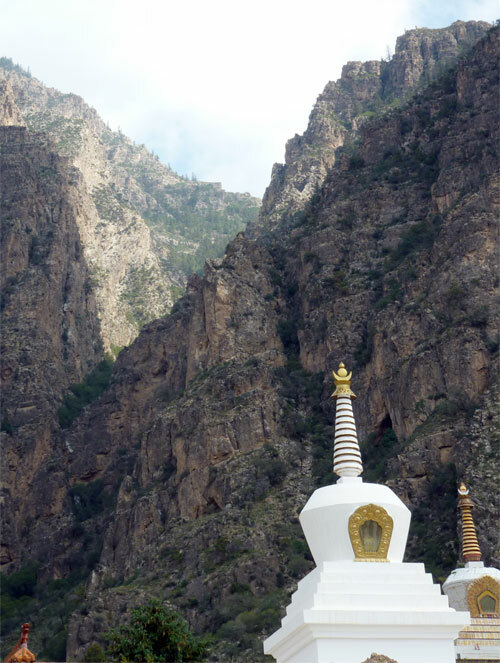 Though the temples aren’t that interesting, the setting is stunning: the complex lies in a kind of fertile bowl, protected by steep rocks and boulders, some decorated with colourful inscriptions in Tibetan. 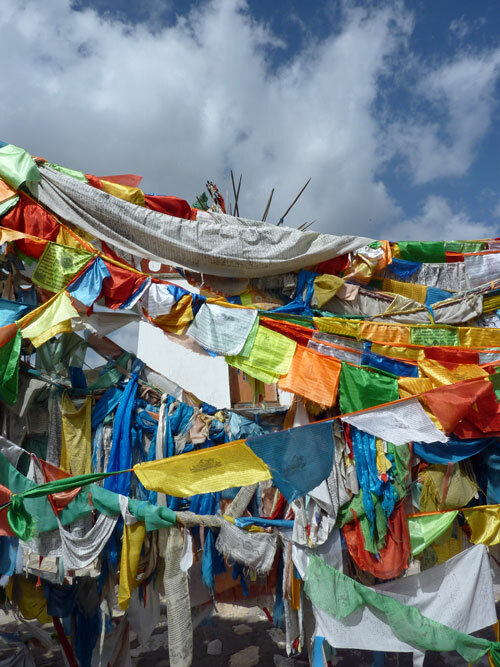 Higher up on the hillsides there are trees, hung about with prayer flags. It’s a shame we won’t have time for the walking trails mentioned in the Lonely Planet. Soon we are on our way again, driving through the stark desert landscape which is such a contrast to the little oasis we’ve just left behind. Judging by the amazing scenery, the detour in the other direction, to Moon Lake 月亮湖, must also be worth it. However, it can’t be as unexplored as we imagined, because we cross several tour-buses headed that way. We get the feeling this whole area is being heavily developed, perhaps to take the pressure of already saturated tourist spots, as well as spread some of the tourist revenue. After about an hour, we drive into Bayan Khot, cruising along a somewhat dusty main road, lined with ugly concrete buildings. Adam, whose confidence was up after yesterday’s successful sightseeing, is getting worried again, apologizing for taking us to such a dreadful place. He’s also obsessed with finding the LP mentioned Xibei binguan, supposedly right next to the bus station. I (Margie) am not so keen, suspecting (rightly) that better places will have been built since then. Fortunately, we never find the place. We pass several desultory-looking hotels and David and I actually enter one. We are turned away apologetically, ‘sorry, no foreigners’, and are told that the one place that will take us for sure is the ‘A meng 阿盟宾馆’. Cruising some more and asking several locals, including taxi drivers, we eventually get there. There is certainly a lot more to this Bayan Khot than that dusty road we came in on; there seems to be a huge city beyond it! Meanwhile, the ‘A meng’ looks intimidatingly posh; it’s a whole series of buildings, set around a large compound and with a sleek, gleaming reception, staffed by friendly young ladies in army fatigues. 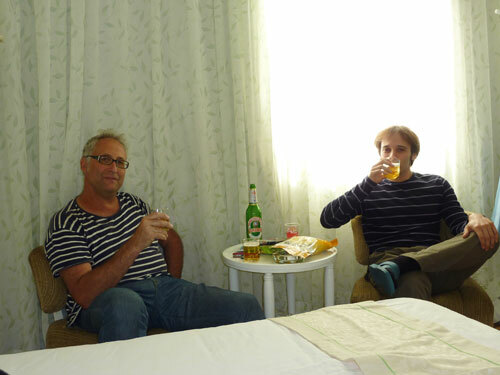 David and I approach with trepidation, but are relieved to learn that cheaper, smaller rooms in the side building go for 260 Yuan. That’ll do nicely. 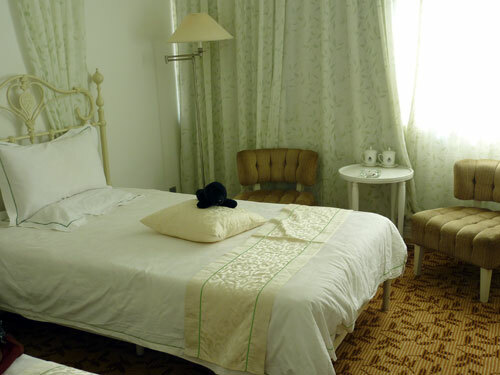 Our rooms are amazing and we are childishly pleased when we step into the immaculately white interiors, resembling French boudoirs, with modern bathrooms and all creature comforts. Do we really have to leave again tomorrow, at some ungodly hour, just to go to a desert? Alas, there is no keeping Adam; that desert is calling him. He rushes out again, with another taxi driver he picked up in the hotel compound while David and I were checking in, to buy tickets for tomorrow’s 7.20 bus to Alashan Youqi. This turns out to have been a clever move: we are already seats 21, 22 and 23. Adam reports back that there is a brand-new bus station now, further out than the old one. According to the taxi driver, the Xibei binguan still exists, but is a bit of a dump. After a well-deserved pijiu (beer) break we manage to drag ourselves out of our comfy rooms to go and see Bayan Khot’s two listed sights: the Yanfu Si 延福寺temple and the Alashan bowuguan (museum) 阿拉善博物馆, housed in the former residence of the Alashan Qin Wang, the last prince of the area. These sights are not in the old-looking building near our hotel, as we initially thought, but actually require another taxi ride. A group of friendly teenagers flag down a car for us and wave us off. While in the taxi, we can fully appreciate the size of this place; there are huge squares, endless avenues and housing developments everywhere. When we get close to the temple, we have to get out of the car, due to building works. 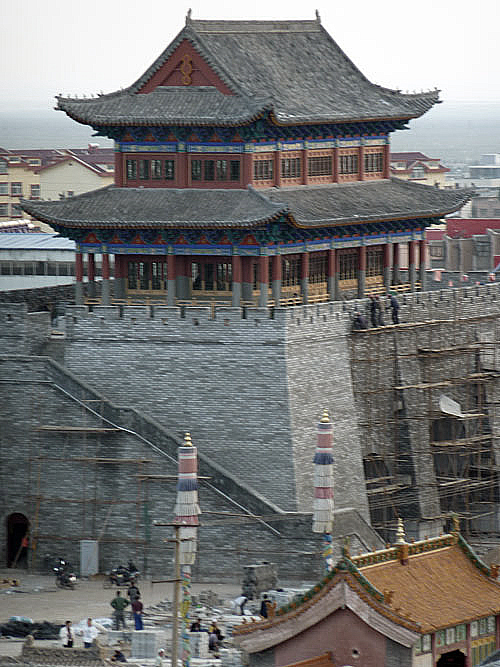 To our amazement, we find ourselves outside a brand-new city wall under construction! 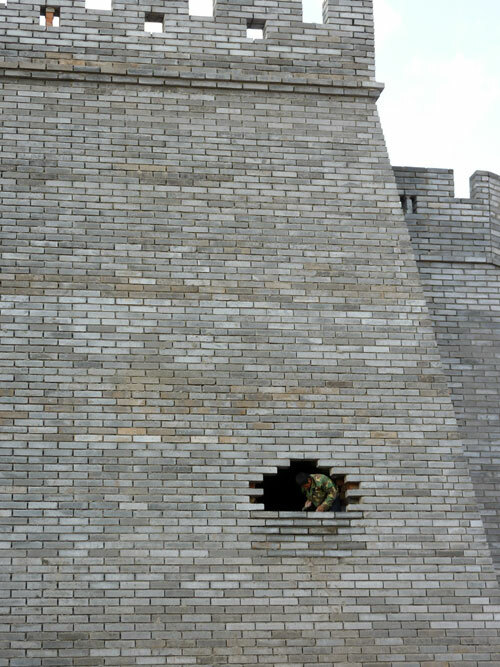 Next to the entrance gate there is still a curious hole in the grey surface, which a bricklayer is busy filling in. 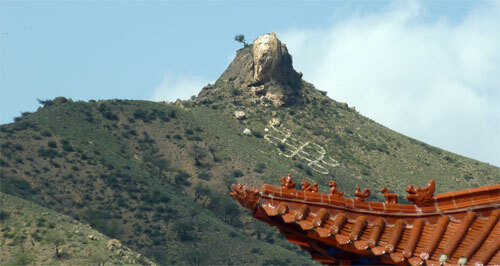 The Yanfu Si is ancient, covered in dust and mostly closed. Apparently the keeper has just left. Outside, we meet a man who is working on the paintwork. He says that some of his colleagues and he have come from Chengde to work here, on the restoration (or should we say rebuilding?) of the temple and museum. The residence of the Alashan Qin Wang is also undergoing a complete overhaul, but nobody seems to mind us going in and poking our noses in at windows and doorways. We come across two young girls who are showing an elderly couple around and who seem to be rehearsing their lines for future guided tours. We just tag along and climb up behind the residence where a park is being laid out, complete with a moon gazing terrace. Old Bayon Khot but how old? When we’ve exhausted the sights, we go for a walk. 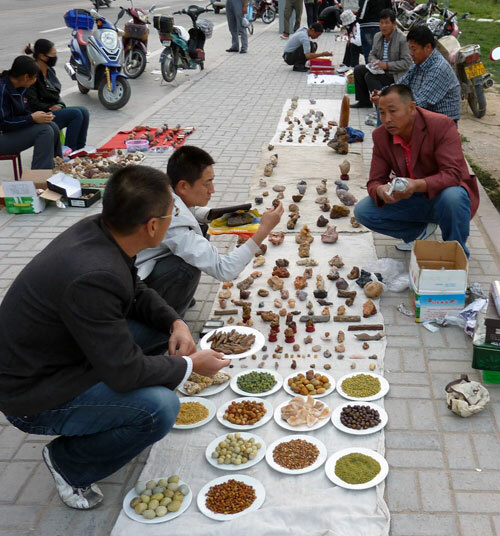 At the other end of a nearby square we find the mineral sellers, mentioned in the Lonely Planet. It’s a pity we don’t know anything about rocks and minerals, so we can’t really appreciate what we’re looking at. 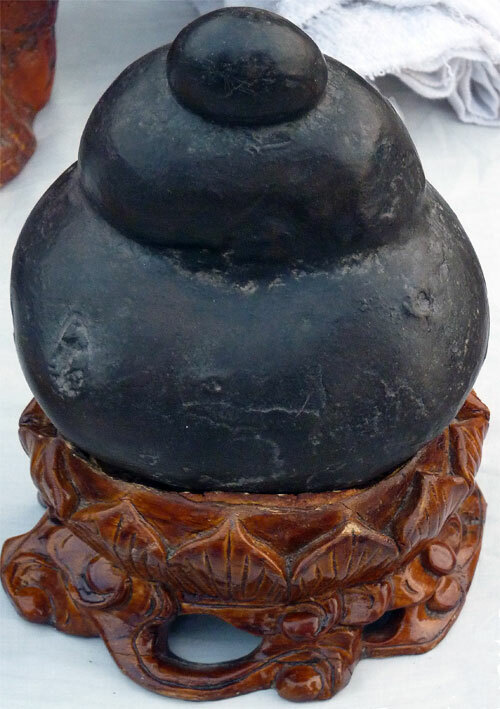 The sellers are a friendly bunch and they don’t seem to care that we’re not buying; though we are very tempted by a black, rounded stone, mounted on a wooden pedestal like a fat Buddha on a throne. It’s going for 600 Yuan, but is fortunately far too heavy for us to take. The owner of the black Buddha has recommended a restaurant to us and we hop into another taxi, back in the direction of the hotel. It’s getting dark now and suddenly we find that the outlines of all buildings and even trees are illuminated in blue, pink, purple, red and green. It’s extremely tacky, but festive at the same time. 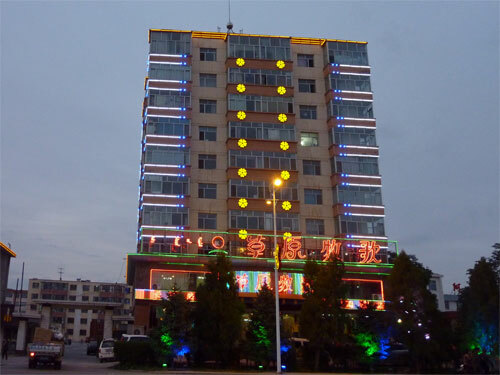 We are dropped outside a large modern building, lit up like a shopping mall at Christmas time: the Caoyuan Muge restaurant (or Songs from the Grassland Restaurant 草原牧歌饭店). It seems that Bayan Khot has prepared another surprise for us: the place specializes in small, individual hot pots that come in many different flavours and are kept warm on electric hotplates. 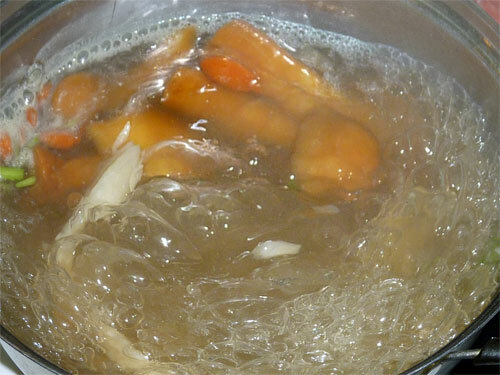 We choose two mushroom flavoured broths , one plain, plus an extra, milk flavoured one, just to give it a try. 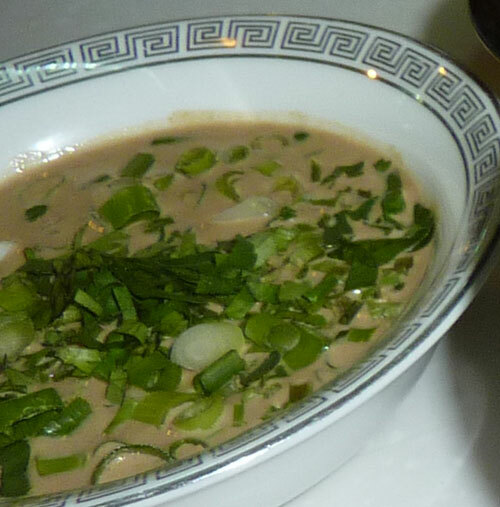 The waitress, with typical Chinese candour, has warned us against it, telling us not even the locals like it, but we insist. It’s actually quite tasty, with a cheesy flavour that goes especially well with cauliflower. 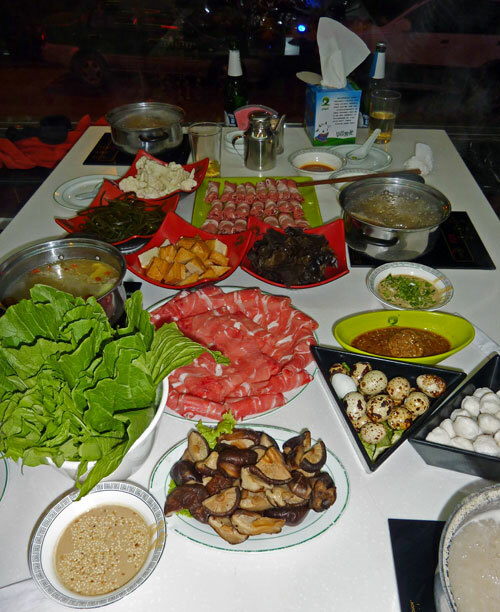 Ingredients are plentiful and fresh: we have thinly sliced beef and lamb, fish balls, quails eggs and lots of vegetables. There is a long table with a whole assortment of sauces and condiments and you can have as many refills as you like. When we have eaten our fill and are on the way out, the friendly owner asks to have her picture taken with us, and we gladly oblige. Finally, once outside, a taxi which already has a monk in it, stops for us and takes us home. All in all, it has been a very interesting day. Is it really all for Adam? 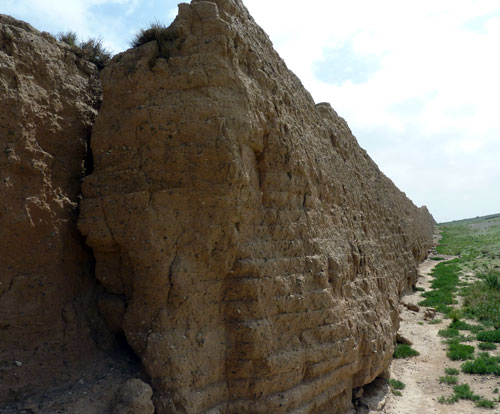 It takes about 2 hours to drive to Bayan Khot from Yinchuan, without stopping along the way. Buses leave from Yinchuan’s long distance bus station throughout the day. It will soon be even quicker when the new motorway opens. 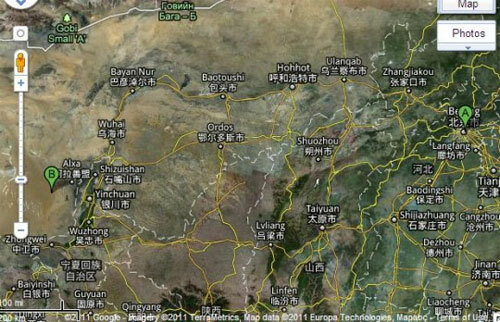 Both Guanzong Si and Moon Lake are about an hour’s drive away from Bayan Khot. 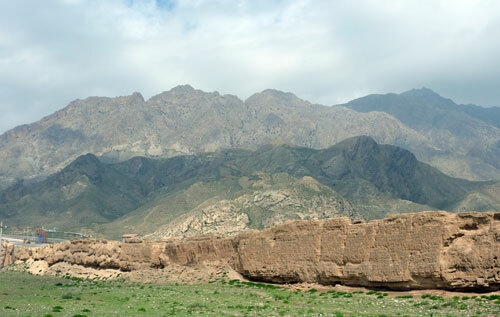 There is a daily bus from Bayan Khot to Alashan Youqi (For the Badan Jaran Desert), which leaves at 7.20 from the new bus station and takes 7 hours. It’s a good idea to buy tickets in advance. 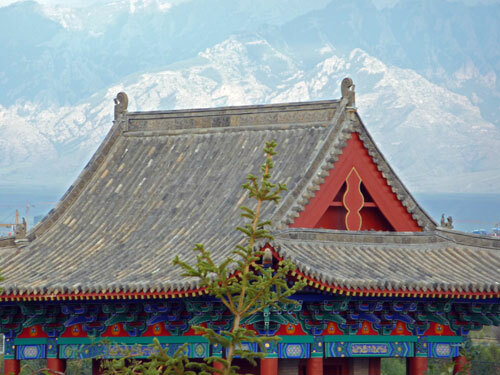 There are also buses to Inner Mongolia’s other tourist hotspot Ejina qi, famous for its autumn scenery. We stayed at the ‘A meng’ hotel where the cheapest doubles seemed to go for 260 Yuan. The excellent value rooms were clean and comfortable and included internet connections and breakfast. Staff was able to give some tourist information about nearby sites and help with the organisation of excursions, but only in Chinese. We saw many other hotels, most of them probably cheaper, but apparently not all of them were willing, or allowed, to take foreigners. 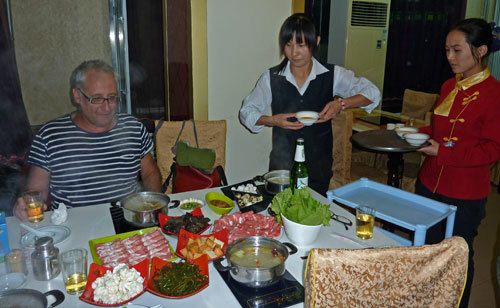 We ate at the Caoyuan Muge restaurant (草原牧歌饭店 ) where we had one of the best huo guo’s (or hot pots 火锅) ever, for around 120 元(Yuan) between three people, including loads of beer, but there were many other places in town, for instance in the vicinity of the mineral sellers’ square. 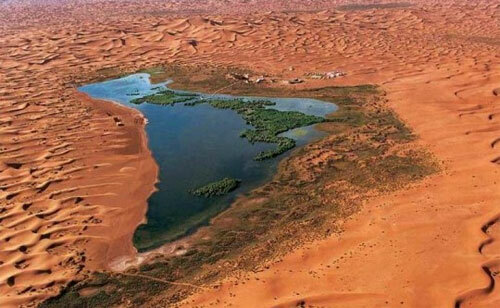 Wow, how in the world did you know about these places? Can I come too the next time you go to China? Just a thought. I’m planning to go to Anhui province in May. I wish I was going to Anhui in May. It should be stunning. I imagine you are going to Huangshan and the nearby villages. 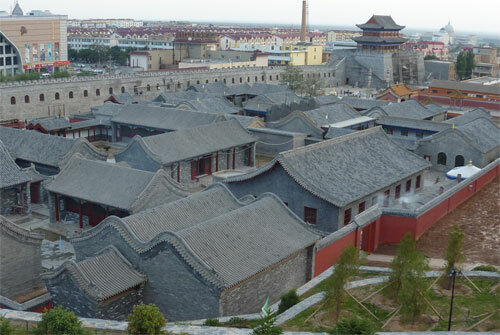 If you want to get of the beaten track a bit also try Jiuhuashan and some of the same Huizhou villages such as Chengkan , Shexian or Yuliang. They are still quite undiscovered. Even better drop down to the Wuyuan region in Northern Jiangxi (just a few hours) and explore the villages there. If you are lucky the rapeseed plants should all be in full bloom. We have been to Wuyuan , Shexian and Jiuhuashan, though many years ago. I’d love to know what the other two villages are like.